It’s Secret Recipe Club Reveal Day! In SRC, members are secretly assigned another participating blog, look through all the amazing recipes, choose one to make and then reveal! 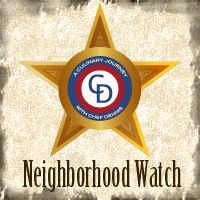 Today, I was assigned Tracy’s blog, Pale Yellow. Tracy is a science teacher/curriculum specialist by day and a baking blogger by night. She loves to bake and bring to treats to her awesomely appreciate co-workers. Since the Pumpkintinis didn’t come together in time, I decided to tackle a homemade version of a classic: Fudge Stripe Cookies! I mean, who doesn’t love a fudge stripe cookie? The homemade version of the fudge stripe cookies makes a small batch, though the actual amount seems to vary a lot based on how thin the dough is rolled (I got 14 cookies, Tracy got 9, the original recipe claims 25), with a surprising ingredient list. Instead of the typical cookie staples of butter & sugar, these called for clarified butter and corn syrup. The end result, however, was phenomenal! The cookies were crunchy and flavorful (in fact, I liked them even better after they sat on the counter for a couple days and got crunchier!) with just the right amount of chocolate. Plus the small batch fulfilled my fudge stripe cookie cravings for a while! Thank you, Tracy, for a great recipe! *To clarify butter, place 1 stick of butter in a small saucepan over medium heat. Melt the butter and skim off foam as it forms. Remove the pan from the heat before it begins to brown (browning the butter will eventually turn it into ghee, which is similar to clarified butter, but not what this recipe uses). 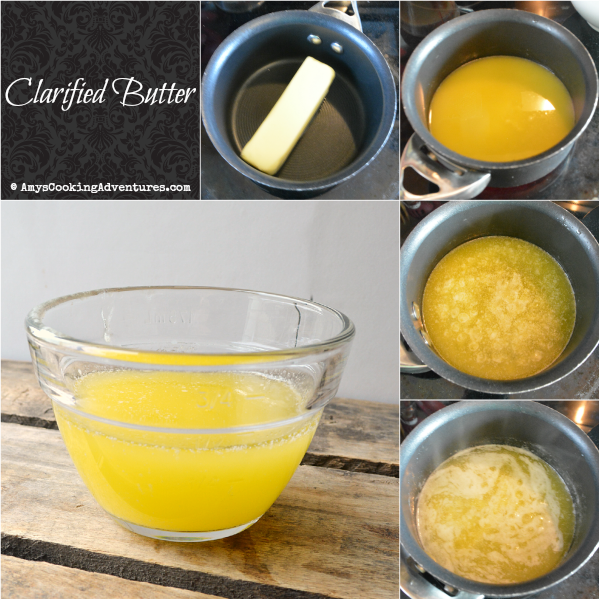 If desired, strain the clarified butter to remove any remaining solids. Cool slightly before using. *I tried to press a diamond pattern into the dough before baking. Only the deepest patterns survived the baking process. Luckily, these look nice smooth, too! *I sometimes get annoyed with weighing recipe ingredients, so I added measured ingredient amounts in parentheses. Note that these measurements will not be as exact and may cause slight fluctuation in the recipe results. Preheat the oven to 350 degrees F and line a baking tray with parchment or a silicone mat. Place the flour, baking soda, clarified butter, corn syrup, and vanilla extract in the bowl of a stand mixer fitted with the paddle attachment. Mix on medium-low for 1 minute or until well combined. Press the dough into a ball, wrap in plastic wrap and refrigerate for 5-10 minutes. Sprinkle additional flour on to a rolling mat (or waxed paper). Roll the dough to a ¼-inch thickness. If desired, press a diamond pattern into the dough or gently press a pattern with the tines of a fork. Use a 2 ½-inch round cutter to cut out the cookies. Then use a ½-inch round cutter (or the bottom of a piping tip) to cut out the center of each cookie. Place on the prepared trays and bake in the preheated oven for 8-10 minutes or until the cookies just begin to brown. Cool completely on wire racks. Once cool, melt the chocolate, tempering if desired (I didn’t). Gently dip the bottom of each cookie into the melted chocolate. Lift and let the excess chocolate drip off. Place the cookies on a clean piece of parchment or silicone mat to harden. Once the cookies are all dipped, scrape the remaining melted chocolate into a piping bag fitted with a #3 decorating tip (alternately, place the chocolate in a zipper bag and cut off the tiniest bit of one corner). 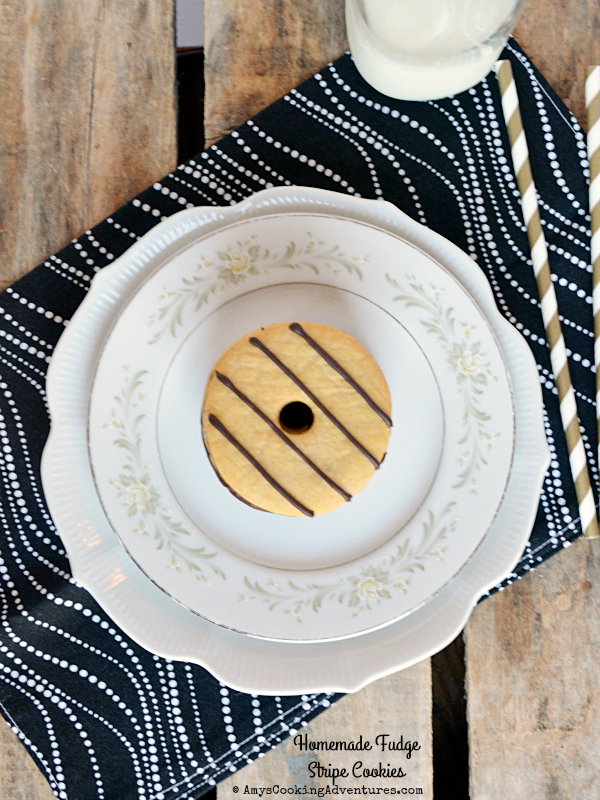 Use the chocolate to pipe stripes across each cookie. Allow the chocolate to harden, about 30 minutes (or place in the refrigerator for 10 minutes). These sounds delicious! Who wouldn't want to have one or two with a cup of tea or coffee? Mmmm... Great selection. 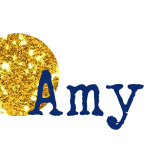 Great choice Amy! You chose an old recipe, I forgot about. You're right about the weird quantity. I remember emailing the original author to troubleshoot why I got so few, and there was never much of a conclusion. Glad you enjoyed! These look beautiful, and so easy! Thanks for sharing! Those Keebler elves would be proud! Kidding...do these look yummy. Thanks for posting with the SRC. 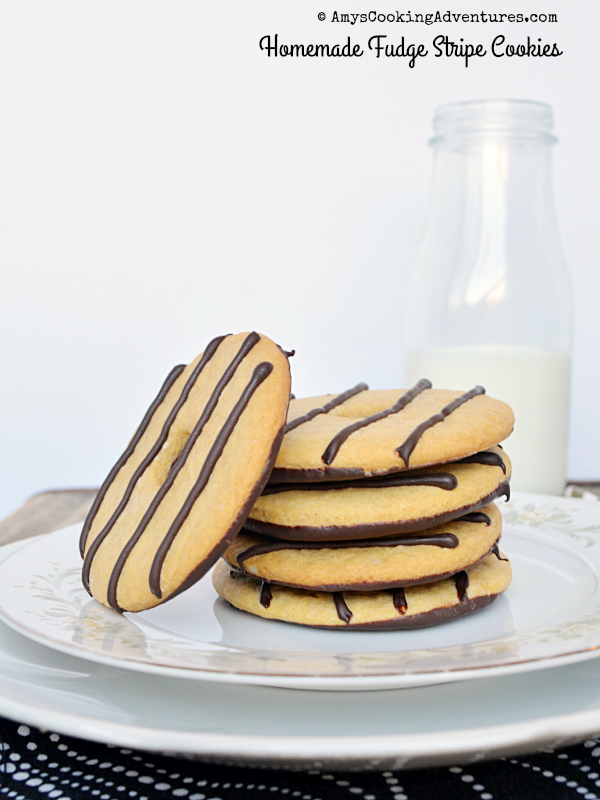 I think everyone likes these kind of fudge stripe cookies. Great SRC post! 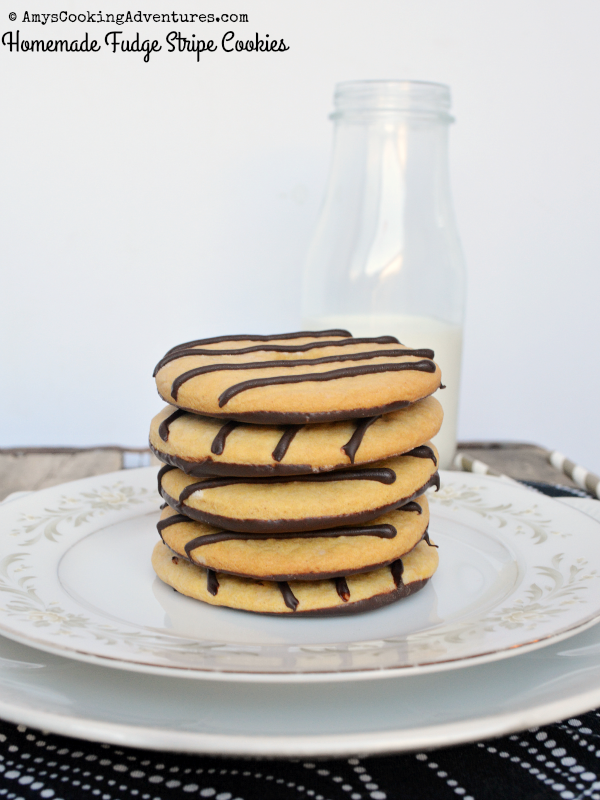 Love fudge stripe cookies and love recipes that don't make dozens of cookies. Oh, wow - a homemade version of a classic! Yum! They look wonderful! Great recipe choice! You're right! I love fudge striped cookies and these look so good! Love your delicious looking pics too. By the way, you can buy organic Ghee, or clarified butter, to make this recipe a little quicker to pull together.Great choice for SRC!